Inflation hits all of us hard. It’s a drop in purchasing power. So let’s adjust the Nifty for a “constant” purchasing power by removing the inflation impact. 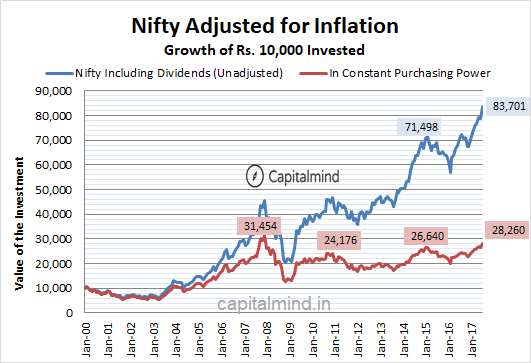 So if the Nifty was 1000 in year 1, inflation in year 2 was 10%, and the Nifty went to 1100, what would the Nifty “adjusted for inflation” be? Answer: 1000. You just adjust the 10% downwards and find the equivalent number in the purchasing power of year 1 – so it’s comparable. Here’s what the Nifty looks like in constant rupees of the year 2000. Assume you invested Rs. 10,000 then and it bought you, say, 1000 dosas. Today, it would become Rs. 83,701. But that won’t buy you 8300 dosas – because the price of dosas has gone up. It will buy you just 2826 dosas. If you counted your net worth in terms of number of dosas you could buy (we won’t judge you), then you’ve only gone up 2.8 times in about 17 years. 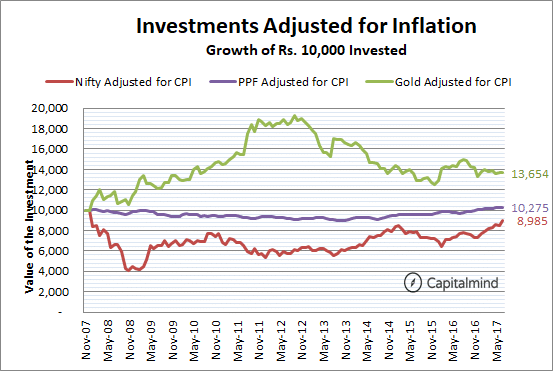 If you’d thought your favourite safe investment – the Public Provident Fund- had beaten inflation hugely, then here’s the answer: No, it hasn’t. In the last 10 years, it’s barely kept up with inflation and only recently has the return, adjusted for inflation, gone into positive territory. Gold has been the best thing to have bought. But even that only made sense till 2012. After that, even gold has fallen, while equities have made a recovery. Considering that most mutual funds have beaten the Nifty by about 5-10% a year, you should have a very positive real return if you invested in them, or in mid- and small-caps directly. The Nifty isn’t your return. This post doesn’t tell you to buy this or sell that. It just provides a perspective with which we can view markets. Over time, markets should beat inflation, and there is a starting point bias (things look good if I start from 2000, a market low. Not good if I start from 2007, a high). But it is useful to see returns in the context of how they really are with respect to inflation. Only recently have returns been substantially higher than your tomato price increases – otherwise, they’ve hardly kept pace.